And the livin’ is easy……. I love that number from Porgy and Bess, but I dread the coming of the dog days. Whether or not you subscribe to the global warming theory, two things are for certain here in Central Virginia: it doesn’t snow like it used to and Spring is getting shorter every year. The mercury is headed north of 80ºF today, which qualifies as hot in my book. Which means that I’m bending a lot of “rules.” Recently I advised the Derby Day party goer to wear a seersucker jacket… well ahead of Memorial Day. Off come the socks (at home), out come the linen shirts and odd jackets and today, I’m wearing the second summer tie of the year. What qualifies this as a summer tie? It’s cotton for one thing, and pastel for another. It just screams “less serious” especially when paired with my Brooks Brothers pink pinpoint oxford button down and cotton suit. But let’s say that you want something a little more serious to wear. Silk ties are always the rule. But that doesn’t mean that you can’t find one that’s a little more summer-y. 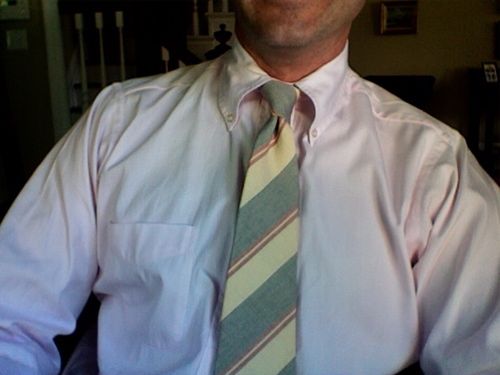 The tie in the image above was purchased from Lands’ End a couple of years ago. They had several versions and most were sold out. In fact, this one was on backorder. What makes it a summer tie? It is woven on a white ground, and with its pink and khaki stripes it pairs very nicely with a khaki or tan gabardine suit. There are a number of fabrics from which to choose while hunting for your summer stock: seersucker, linen, madras, cotton, silks… just don’t be afraid to be a little playful. There are those who swear by whimsical ties and they do lend a certain preppy “cocktails on the veranda” feel to your summer look. For those for whom a USD$160 Hermès or Ferragamo tie isn’t in the cards, our local legendary men’s store Peter Blair offers a more economical, yet no less elegant, alternative in both four-in-hand and bow ties. So go ahead and lighten up a little early this year. But don’t break out the spectator shoes and white linen suits just yet. A gentleman must have his standards. 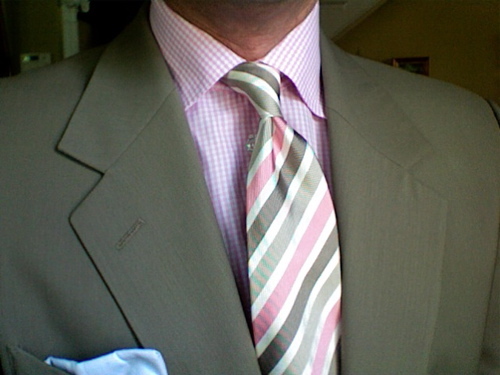 This entry was posted in Elegantology and tagged Elegantology, neckwear, summer clothing. Bookmark the permalink. In linen again, but NOT white linen… still a few weeks to go for that. Ooo you look snappy in that last shot! You look mighty fine and dandy, cool as a cucumber even for the hottest of summer-time days. Love the white pocket square to cool a furrowed brow.